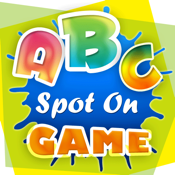 Learn ABC alphabet in the Spot On Game. ABC Spot On Game uses fun, music, and activity to help you learn your alphabet. We're always looking for fun ways to engage kids with learning and technology. ABC Games is the perfect combination! Built into our immersive games are different levels of play to help you learn upper and lower case letters, pronunciations, and word sounds.